Var bred to be a star! Boland Stud will be offering,as Agent, a colt (Lot 68) by Avontuur Thoroughbred Farm’s sensational stallion Var at the 2018 KZN Yearling Sale. Champion Sire of 2YOs in 2016-2017, Var is once again atop of the 2YO sires list this season, and has been represented by 17 2yo winners this season, headed by G2 SA Nursery winner William The Silent and G2 SA Fillies Nursery runner up Ghaalla. Also the sire of recent G1 South African Fillies Sprint winner Sommerlied, Var has more than 20 G1 horses to his name, headed by Equus Champions Variety Club, Val De Ra and Via Africa. 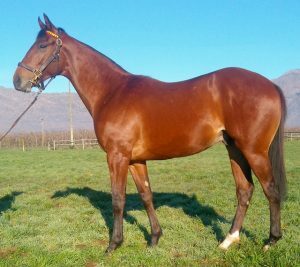 His offspring fare well in the sales ring, with Var yearlings making up to R5 000 000! The Var colt on offer, already named Quatro Five Six, is classically bred on his female side. A half-brother to 2yo winner, and feature race contender, Crimean Queen, Quatro Five Six’s second dam, by proven G1 broodmare sire Rambo Dancer, is a half-sister to the G2 SA Oaks winning sisters Noble Destiny and Royal Prophecy –as well as the exceptional broodmare Gypsy Queen. The latter has produced three graded stakes winners, headed by multiple G1 winner (in USA and SA) Gypsy’s Warning. The Team Valor raced Gypsy’s Warning, whose seven wins included US’s prestigious G1 Matriarch Stakes, is a daughter of Mogok –whose sire Storm Cat is the grandsire of Var! Gypsy’s Warning’s G2 Camellia Stakes winning half-sister Surabi produced the talented G3 performer So Var (to a cover from Var), while another half sibling is the Ormond Ferraris trained Romany Prince. The latter, who has won or placed in 16 races and earned over R750 000 in prize money, downed G1 winners Deo Juvente and Mac De Lago, when victorious in the 2017 G3 London News Stakes.